The stunning Cabot Trail is worth at least 2 days on your 2-week itinerary. Experience the best of Nova Scotia’s southern shore, the Annapolis Valley and Cape Breton in two weeks. This itinerary will show you how to do it (we assume you are driving and doing a loop that starts and ends in Halifax). Head south on Day 3, going via Peggy’s Cove Lighthouse, stopping at Chester for lunch (there’s great seafood chowder at the Seaside Shanty restaurant) before heading on to charming Mahone Bay, with its churches, boutiques and art galleries. The colourful settlement of Lunenburg is your destination for the night. There’s a wide range of places to stay and you can explore the Fisheries Museum of the Atlantic or hop on a boat tour after you’re settled in. 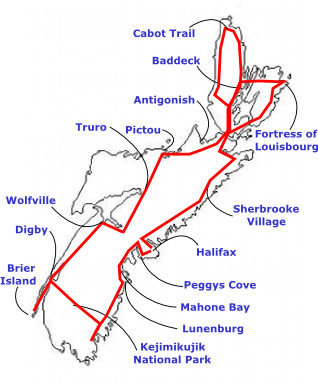 The most pleasant way to do this part of the journey is on Route 333 to Peggy’s Cove and then on the minor roads along the coast, rather than taking Highway 103. There’s a little more driving on Day 4 so hop on the highway to Liverpool. Here you have the choice of going a bit further south to the seaside adjunct of Kejimikujik National Park and historic Shelburne or exiting directly onto Route 8, which cuts across the province and through the main part of Keji. On a nice day, stop for a swim in the freshwater lakes of the park before carrying on. Once on the Bay of Fundy side of Nova Scotia, turn south towards Digby but watch for signs to Bear River. This is a delightful village full of artists and colourful houses. It’s a must-see place before you stop in Digby for the night and feast on local scallops for supper. Head for Brier Island on Day 5 – one of the best places in Nova Scotia to spot wildlife and go whale watching. It’s not far from Digby so you might want to return to your hotel there. On the other hand, there are some incredibly beautiful places to rest on the island itself. 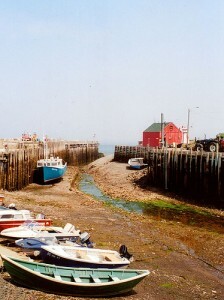 Halls Harbour at low tide. On Day 6 you start heading north and your first stop is Annapolis Royal and historic Fort Anne. Grab a bite to eat here and then carry on to Kentville, where you can branch off towards the coast and the fishing village of Halls Harbour – a great place to buy lobster fresh off the wharf and see the world’s highest tides in action. Make your way from scenic Halls Harbour to the university town of Wolfville, where you’ll want to splurge on a night in one of the many upmarket B&Bs, browse through the shops and explore Acadian history and wineries at nearby Grand-Pre. Day 7 is ideally spent in the same area. There’s so much to explore. 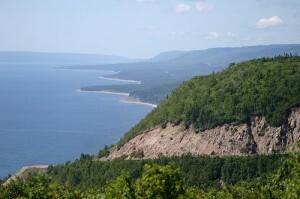 One must-do is the hike to Cape Split in Cape Blomidon Provincial Park, easily combined with a stop at The Lookoff – a popular viewpoint on Route 358 near Blomidon. For something more tranquil, stick around Wolfville and visit the many art galleries and gardens or drive out to tiny but picturesque Canning. Start Day 8 by driving towards Truro. On the highway this takes about 1-1/2 hours but Route 215 along the Minas Basin is more scenic, if a little longer.You can break up the trip in Maitland, where the Lawrence House Museum tells about the area’s shipbuilding past. Tidalbore rafting is Maitland’s other claim to fame but if you’ve got your heart set on trying out this unique Nova Scotian activity, check the tide times and book ahead. You can overnight in Truro, which has plenty of services, B&Bs and pretty Victoria Park, but if you don’t mind driving for another 45-60 minutes, carry on to Scottish-inspired Pictou instead, where the Hector Heritage Quay awaits you on the waterfront with its story of carrying the first settlers in 1773. On Day 9 you pass through Antigonish, home of Saint Francis Xavier university and with its fair share of cafes and art galleries, and arrive on Cape Breton Island via the Canso Causeway. Stop at the tourist bureau as you drive onto the island and then head for the resort town of Baddeck and give yourself the better part of an afternoon to learn about the inventor of the telephone at the Alexander Graham Bell museum and take in the beautiful scenery. Days 10 & 11 are dedicated to the spectacular Cabot Trail. Most people drive it clockwise, going through Cheticamp and Pleasant Bay towards Ingonish. Although you can drive the road in about 4 hours, the breathtaking scenery and large amount of things to explore means you’ll want to go far slower. Do at least one hike in the Cape Breton Highlands National Park (the Skyline Trail is a good choice) and if you haven’t taken a whalewatching tour yet, this is another fine spot to do it. There are many places to spend the night but one night in Cheticamp or Pleasant Bay and another in Ingonish works well. Before you leave the Cabot Trail, stop at St. Ann’s to see the Gaelic College of Celtic Arts and Crafts. The Fortress of Louisbourg is your focus on Day 12. It’s on the east coast of Cape Breton so rise early and get there by mid-morning. There’s enough to keep you amused for at least half a day and you can eat lunch inside the fortress, in a period restaurant. Once you’ve had your fill of history, drive south on Route 4 along the Bras d’Or Lakes and stop at a waterside B&B for the night, perhaps in St. Peter’s. It’s time to head back to Halifax on Day 13, this time along Nova Scotia’s eastern shore where you’ll find Sherbrooke Village, a living museum that shows what life was like 100 years ago in this community that thrived on shipbuilding, timber and a gold boom. From Sherbrooke, the coastal road winds and twists its way through fishing coves and villages with memorable names like Ecum Secum and Beaver Harbour. More nostalgia awaits you just outside of Halifax at the Fisherman’s Life Museum in Jeddore, which shows what life was like for these communities in the 1940s. Also worth a peek is Lawrencetown Beach Provincial Park, a favourite for surfers, and Eastern Passage with its artisan shops. Day 14 and your tour around Nova Scotia is complete. Take one last look at the capital city, grab a few souvenirs for the folks back home and pack your bags.